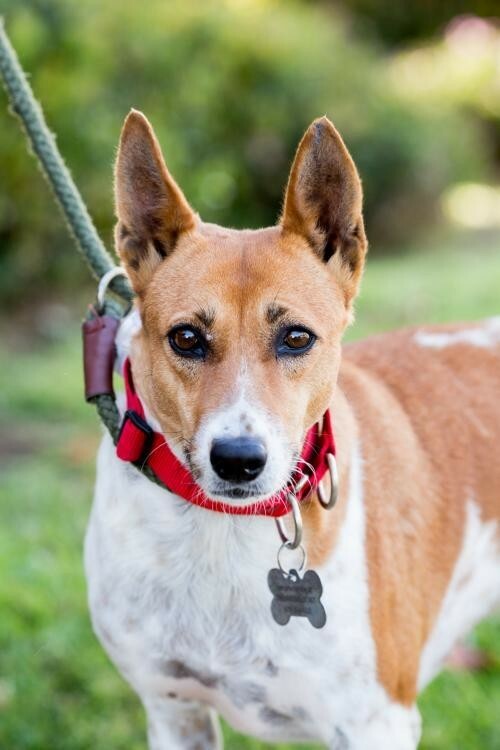 Meet Bolly, a beautiful Basenji/Red Heeler mix! Bolly is a Soi Dog rescued from the illegal dog meat trade in Southeast Asia by Soi Dog Foundation, our partner rescue based in Thailand. She and a group of her friends traveled from the SDF facility in Phuket and were flown stateside to The Barking Lot in December 2017. Bolly has a very sweet and docile personality. She may appear timid and shy upon first meeting, but her affection grows quickly with familiarity. Even within the same day, we can tell that Bolly grew to appreciate the presence of new volunteers by the way she gently waves her tail at the sight of a familiar face. Bolly is fantastic with other dogs thanks to her mild-mannered ways. She is about 3 years old and weighs 34 pounds - not too big and not too small. She has a very short coat that is quite easy to care for in the grooming department. And who can resist that sweet, expressive face? Good things come to those who wait, and with just a little patience, Bolly will blossom into your loyal and loving companion in no time! If you'd like to meet Bolly, please visit www.thebarkinglotrescue.com/adopt.